There are too many enablers out there. There's the quilt shops who get all those wonderful fabrics and layer cakes and charm packs we can't resist. Then there's Nicole on Tuesdays. And then there's my sister. She called me at work a couple of weeks ago to have me look up this little green sewing machine with cabinet on the internet. She volunteers in a charity thrift shop and they were trying to figure out what price to put on it. Well, I found out it is a somewhat rare and loved by those who have this model, Singer 15-125. By the time I called back they had already priced it at $30. I said , "I'll buy it!" So she bought it and brought it up to me Easter. I also found out that people treasure this model for the ease of free motion quilting it does. Now mind you, I have a really nice Bernina with the stitch regulator and no amount of classes and practice has allowed me to master free motion quilting on it. But I did try it on the Singer and it's true-it quilts like a dream. So I'm thinking I'll be quiting some small projects on it. then here's the toy machines in the above picture. The one on the right was mine when I was a little girl. 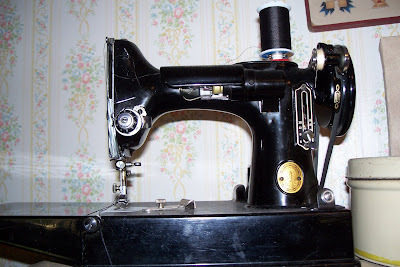 And I almost forgot that I have a treadle machine that was hubby's grandmother's. I've never used that thing. So I guess that makes seven-I used to have more but traded them in when I got the Bernina. My Mom was a sewing teacher so I had inherited a lot of machines from her. So here's my question to you-how many sewing machines do you have? I am really interested in who has the most so start counting and post a comment. Update-I remembered that I also have a serger so I guess the count for me is eight! I'll probably remember another that I have hidden somewhere in the house. Just found your blog. LOVELY! Wanted to say I just aquired my 3rd machine today. Actually, last week I had 3 machines, but my daughter informed me she wanted to learn to sew so I gave her my basic Kenmore. Then promptly found a steal of a deal on craigslist for a Brother Electronic VX-950 for $20! Been tinkering all afternoon! My sewing machine collection stands at 5. I use a Brother 400 to piece my quilts and a Brother 1500 to quilt my quilts. An old Kenmore is my work horse for hemming jeans & mending. (The needle-down option on the Brothers + mending = broken needles.) An old Singer treadle is seldom used, but it looks nice. Hidden somewhat is a Singer Futura, purchased years ago because if its freearm, a revolutionary feature at the time. I'm down 2 machines because I gave one Kenmore to my mother and another Kenmore to a quilting daughter. Love your blog. That new Singer of yours is beautiful. You're very lucky to have found it. I have 4 sewing machines, plus 1 serger. 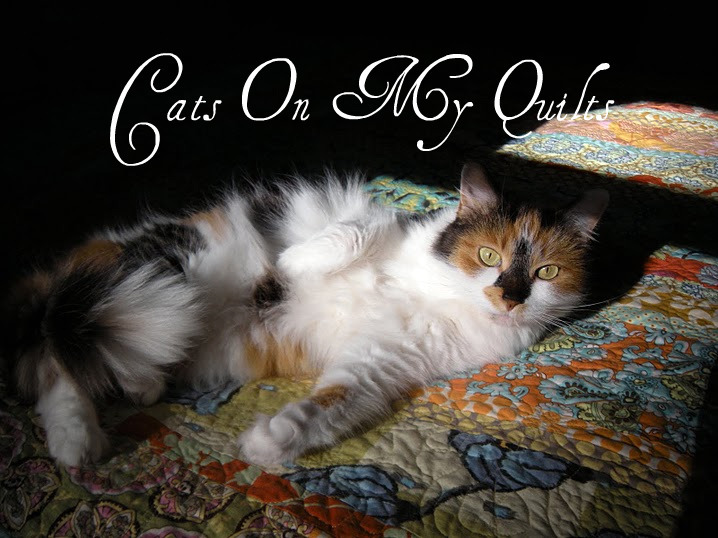 I quilt on a Pfaff 1475, which I love. I also own a Morse from the 1960s, a heavy duty Kenmore from the 70s (still metal), and a Montgomery Ward "White" treadle machine that has the most interesting attachments, as well as the complete instruction book. The treadle came from my great grandmother, and she hauled it on a wagon with her from Montana to Northeastern Washington State. I used to play around on it when I was a teenager, but it's been unused for over 30 years. Still looks good though! Oh my, what a wonderful collection! I have two Berninas, a Featherweight and a Janome Gem. Plus two vintage machines that belonged to my husband's grandmothers. I love your blog!! I have a Viking Lily, a Brother Innovis, White 3300 and a serger. Also two treadles. My DH repaires and refurbishes sewing machines, so we kind of collect them. Oh wow, what a beautiful machine. Let me see, I think I have 10 machines!! Yikes........ I didn't mean to start a sewing machine collection, but it just sort of grew. I mostly sew on my Bernina, and Featherweight. When I am working with flannel or linty fabric, I use my ole faithful Kenmore. Hmmm.. I have 5, two of which are very old and I have never used them. One of these is a Franklin Treadle machine which I would love to get overhauled and learn to use. You new find is so pretty, I am going to have to be on the lookout for one of those as I need all the help I can get for free motion quilting. I think I'm at the bottom of the list with only three machines: the Janome Memory Craft 6600 which I purchased 6 months ago is my "at home" machine--I have an Elna 6004 and a New Home which is set up just like the Elna which I use at the quilt shop where I work part time. 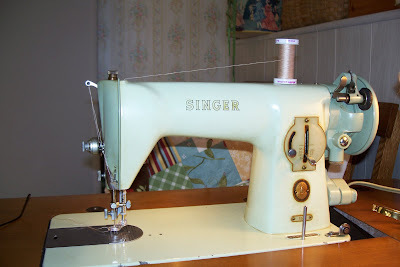 My daughter[who doesn't sew] has a vintage Singer--I forget the model--not a Featherweight, but one of the black, beautifully made 3/4 size machines. I had it completely over-hauled last summer thinking I might use it but didn't get very handy with it. I think we gather "spares" because we can't bear the thought that we might have a day without a working machine. I have a new Viking, a new Quilters Dream from Elna, two featherweights, my old 1974 Singer and my Mom's old 1960's Singer and a Treadle, so I suppose that's 7. I love your green singer. Up until two weeks ago I owned 2 machines now I have five after a garage sale and another friend giving me one. The youngest one, the one I use most is 40 years old and works perfectly for quilting. I have 2 buried in my basement, both from you! 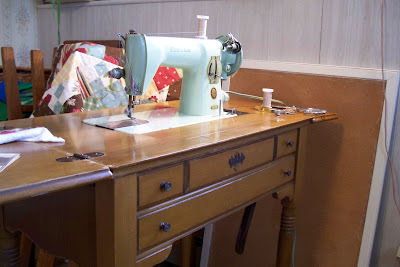 Once I get the craft area organized I can use the lovely singer again, though I'd like a nice table like you have. Oh, and Gerry gave me one for my birthday once but that's still in a box, so I have THREE sewing machines. Don't think I've sewn in a year! Now this is a REALLY neat post! I so enjoyed reading about your journey with the Singer 15-125. It looks to be in such excellent shape. Then to read that you got it, tried it and ohhhh how it worked! I found a smile on my face when I read that. I just acquired my 2nd machine - a Singer 15-125! 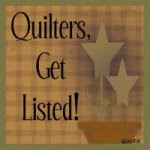 I'm so glad I found this post because I was hoping to use it for free-motion quilting. My dad has had this machine for 10 years (he got it from a friend) and during most of that time he had a fish tank on top of it (!) My current machine, a very inexpensive Brother that I'm "borrowing" from my non-sewing sister, can't handle multiple layers, so it's really only good for clothing and misc crafty stuff. Soooo happy that the 15-125 can be used for quilting, now I've got to clen it up, buy a bobbin case and get it running! Lets see, I have 5 machines which includes my serger. I just bought a Bernina with a stitch regulator & like you for the life of me I can't get a handle on free motion quilting with it. The thread keeps breaking on me. So I go back to my Viking Desiner 1 for my quilting because it just works better for me. You have quite a nice collection. So far I just have one...but I can see how they would be fun to collect. I've just got the one machine, which I've had for the last 23 years! 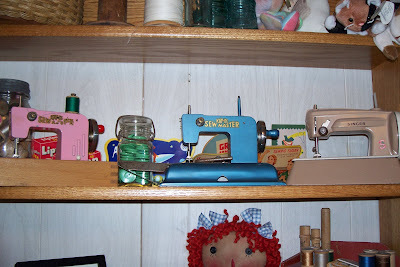 I love that "new" little green sewing machine in that cabinet! Only 8!! !...go get more :) . I only have 2 ! Okay I actually had to go count I Have 2-Pfaff, 1-Husqvarna, & a Janome serger in regular use. I bought a 15 125 two days ago at an estate sale for $30. It's gorgeous- and sews beautifully as do all my Singers. I read in the manual that you can darn/free motion quilt without the presser foot, but it doesn't work. The needle won't catch the bobbin thread. However, I tried it with a darning foot and it works beautifully. What I really love is that thumb screw underneath to lower the feed dogs. Black Featherweight that belonged to my grandmother; although she got it late in life as a collectible. 301A- two tone, brown and cream. 185J- looks like a miniature version of the 15-125. Belonged to my boyfriend's great aunt. Pale greenish white Featherweight in almost brand new condition. Got it at a yard sale where they were charging way too much for everything, but only charged me $10 for the very rare whitish green Featherweight! 328K- from a thrift store. 99K which is in the most gorgeous Danish modern table with matching bench. Also bought a Bernina 530 today. It's very cool but the motor puts off white smoke. Pfaff 260- something wrong with it; can't remember- too many machines. Old Singer serger that I can't get to work-it's me, not the machine- also was my grandmother's. Very old American made Kenmore 70- can't get it to work. Love your blog; would love to hear more about the 15 125. I also have three cats.